I live on the edge. If I have someone coming over, I don't really have a single go-to 'impress me' meal. Life is too short, and there are too many recipes that I still need to make. So I pretty much always cook something new when people are coming over. The worst that can happen is that something won't work out entirely perfectly, and then we can laugh about it. If all else fails, there is toast as an emergency back up! Thankfully, major problems rarely happen (and I have never had to resort to emergency toast). But if you were coming over for dinner, I like to put together some sort of menu because it is fun. Sometimes I put it together myself, other times I use a menu plan out of a cookbook. The weather is heating up here now, so it seems appropriate to remember the time that I made the Summer Menu from 1000 Vegan Recipes. This could be a three course menu if you served the salad on its own first, though I served the salad with the other mains making it a simpler affair. The dessert is easy, make ahead and store in the fridge, keeping things easy. Fresh Tomato Salad with Oh-My-Goddess Dressing: The tomato salad is nice enough, sliced tomatoes served on lettuce leaves with a simple dressing (though the dressing made a bit much than what I really needed). 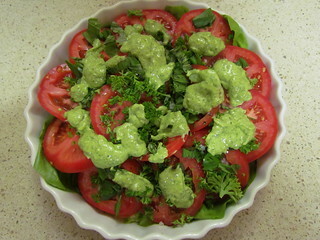 However, it is elevated by then topping it with the Oh-My-Goddess Dressing, a beautiful green concoction of herbs, tahini, lemon juice and vinegar. And it looks pretty too! 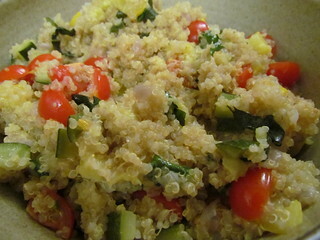 Quinoa and Summer Squash Pilaf: I decreased the quinoa from one and a half cups to just one cup, and doubled the vegetables to get a ratio more to my liking. This gave 4-6 servings, depending on what you serve it with. In this menu, there was plenty to go around. I used a mix of yellow patty-pan squash and green zucchini, which along with the cherry tomatoes made for a pretty colour combination. 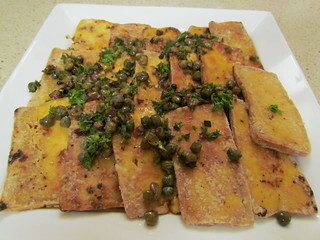 Crispy Tofu with Sizzling Caper Sauce: I enjoy lemony caper sauces, this was reminiscent of piccata, which I love. Though I always wish there was a bit more sauce! The tofu is dredged in cornstarch with salt and pepper, that crisps up nicely in the pan. Here it is, a gorgeous plate of summer menu goodness. 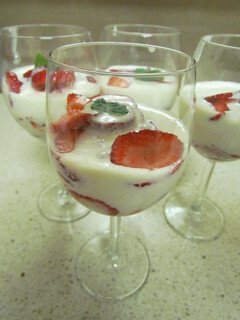 Strawberry Parfaits with Cashew Creme: These didn't end up quite as impressive as I had hoped to look at. The cashew creme didn't really firm up, and wouldn't form layers in the glass. But what's looks when there is taste to conside? The creme is based on cashews and silken tofu, and is sweet and creamy. It is layered with fresh strawberries for a gorgeous strawberries and cream dessert. It would also be super cute with a little sweet biscuit served on top, now that I think about it. But mostly I just love strawberries and cream things. Do you practice making recipes before people come over for dinner? Mo sadly passed away when I was nine. Our next kitty was called Max, and sadly we only had him for six weeks before tragedy took him away from us. He was also a little black kitty, a feisty young man. Here is a bonus photo of me when I was little, playing table soccer with Max. You can tell from his face he is thinking about his strategy super hard (my strategy is mostly just to spin the things randomly and hope for the best). Omg, your curly hair is adorable! Also, I'm loving the look of that fried tofu! 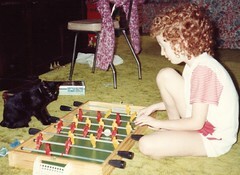 Look at you and your kitty and your awesome hair and your table soccer! What a lovely photo. What you said there, that you spin the things randomly and hope for the best, that's pretty much how I do life. Table soccer as a metaphor for life. I like it. That Oh my Goddess dressing sounds like my kind of dressing. 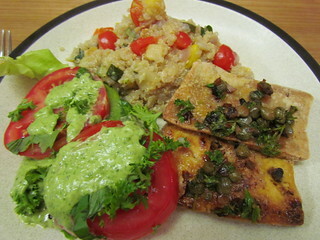 I love tahini with lots of herbs and lemon. When I was little my grandpa and I used to love strawberries and cream for dessert. I love, love LOVE the picture of little you and Max! Thank you, he was pretty cute. We never had Goddess style dressings when I was growing up, but I love them now. The summer menu looks great, and the parfaits sound super tasty! The picture of you and Max is so sweet! They were very tasty. Can't go wrong with strawberries and cashew cream! "So I pretty much always cook something new when people are coming over." The dishes sound great! Especially the crispy tofu - I would love to go to your place for dinner, you would no doubt impress me. What a cute kiddo you were! This looks like a nice spread. I am similar, I like trying out new recipes with people, though I don't cook often with friends. We normally go out to eat since I rarely do that. Going out to eat is always fun as well. I live at home, so I don't have people over that much unless my parents are away. Otherwise it is dinner out.